I love taking photos in Brighton and feel so fortunate that I live close enough to do it quite a lot. 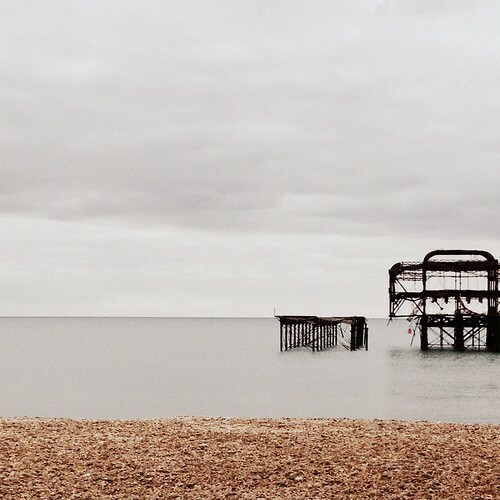 My very favourite thing to take pictures of is West Pier so it makes me so sad to see it crumbling away before my eyes. I am guessing it won't be around for too much longer. I wonder if will just keep falling apart by itself or whether the council will one day decide to just pull what remains of it down. I guess I just need to keep pointing my camera at it as much as I can while it's still there. This photo is full of sadness but it makes me happy as I think it's one of the best West Pier photos I have taken.